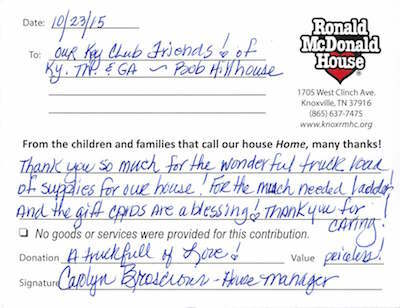 Representatives of the Ronald McDonald House in Knoxville sent this message to the K-T District in response to the items donated at the 2015 Fall Rally. The one item they mentioned specifically on the phone was the step-ladder. They only had one so they were REALLY happy to receive another! Thank you so much for the wonderful truck load of supplies for our house! For the much needed ladder and the gift cards are a blessing! Thank you for caring! Donation: A truck-full of Love! View the Thank You card here!